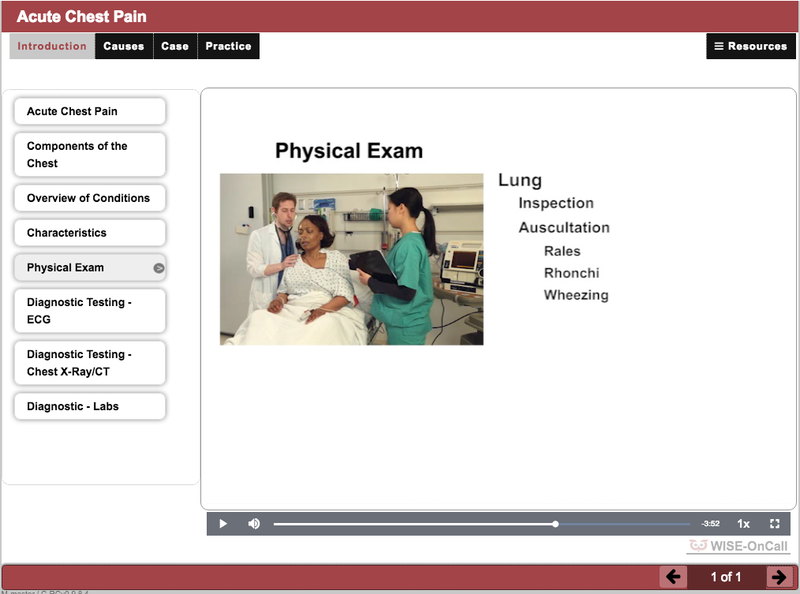 A collection of 12 multimedia modules designed to educate learners (medical students, PA students, nursing students, and beginning interns) about potential medical issues they may encounter while they are on call. Created by NYU School of Medicine. Distributed by Aquifer on behalf of NYU School of Medicine. Available through an independent learning platform from your Aquifer account. 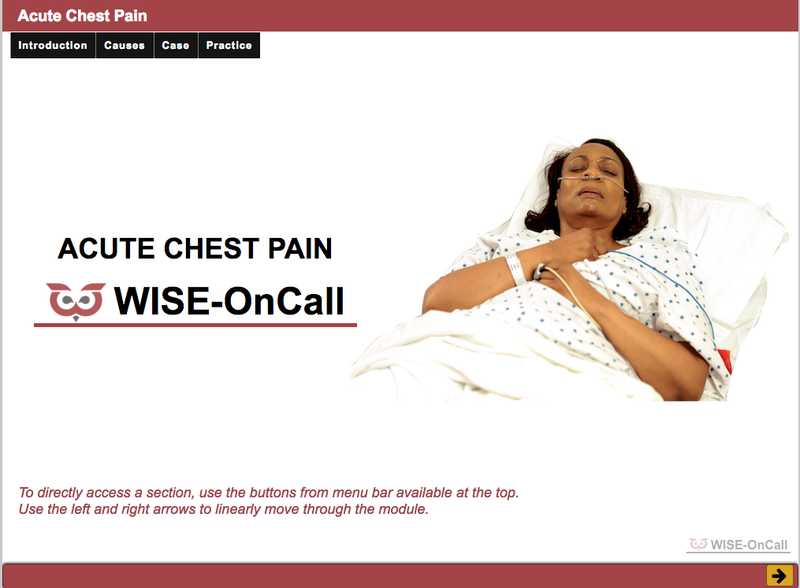 WISE-OnCall helps medical students prepare for their transition to residency through a symptom-based review of conditions that they will likely encounter while on call. 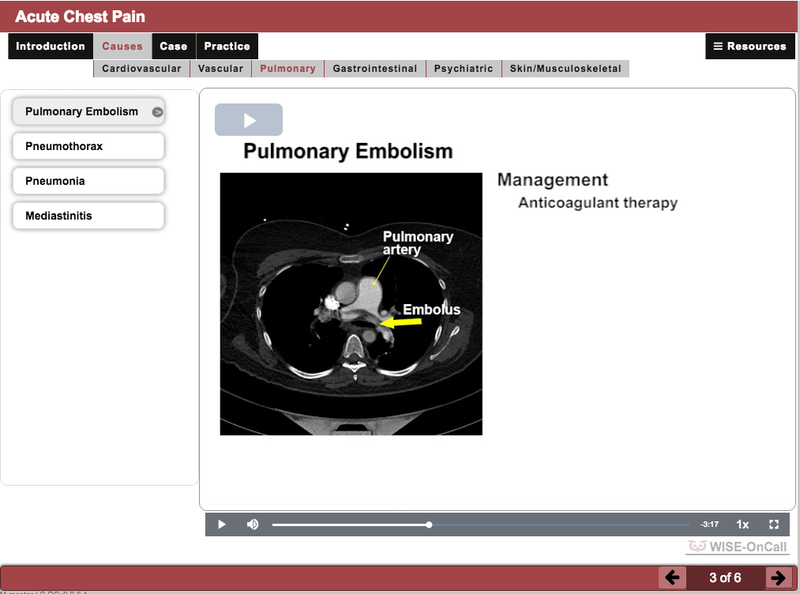 The modules provide a common, pre-residency learning experience to students with different undergraduate educational experiences, serving as a “refresher” to fill gaps in students’ clinical knowledge. The offering currently includes 12 modules, each focusing on a particular symptom or clinical skill. 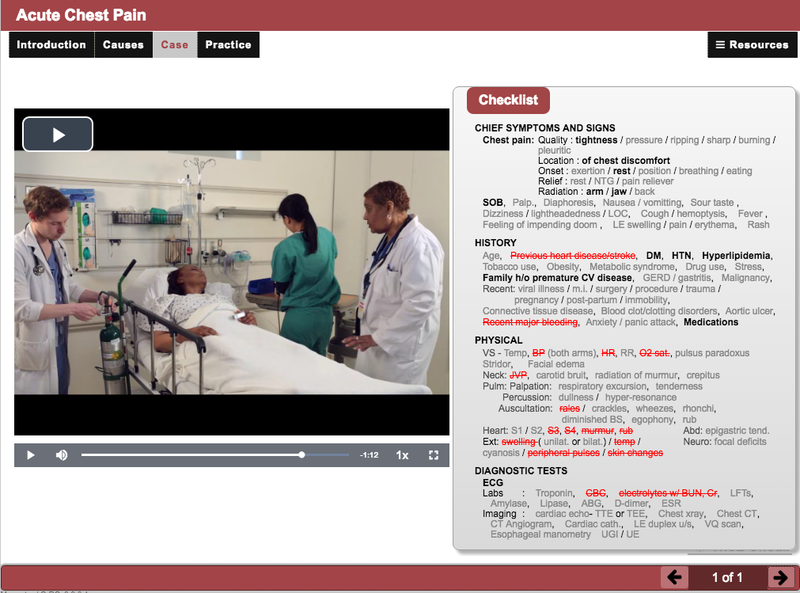 Modules incorporate a didactic review of key concepts and causes associated with the presenting symptoms, simulated cases which model a residents response to on-call scenarios, case-based practice questions which allow the student to test their knowledge, and symptom checklists to help students focus on the larger constellation of symptoms when prioritizing their differential. The modules also stress the importance of and model appropriate interprofessional communication. WISE-OnCall has largely been targeted at 4th-year medical students’ preparation for and transition to residency. To that end, the offering’s design has been informed by the AAMC’s Core Entrustable Professional Activities. Modules have been integrated into advanced clerkships at some institutions. Others have incorporated the modules into focused capstone or transition to residency courses. The modules could be integrated in the traditional third-year clerkships to introduce or review clinical reasoning. They have also been blended with preclinical coursework to demonstrating the practical clinical importance of concepts in the basic sciences. In post-transition residency education, WISE-OnCall may be used as a baseline, self-directed learning activity to address the variability in incoming students’ educational experiences and increase their preparation for managing in-patient clinical situations. 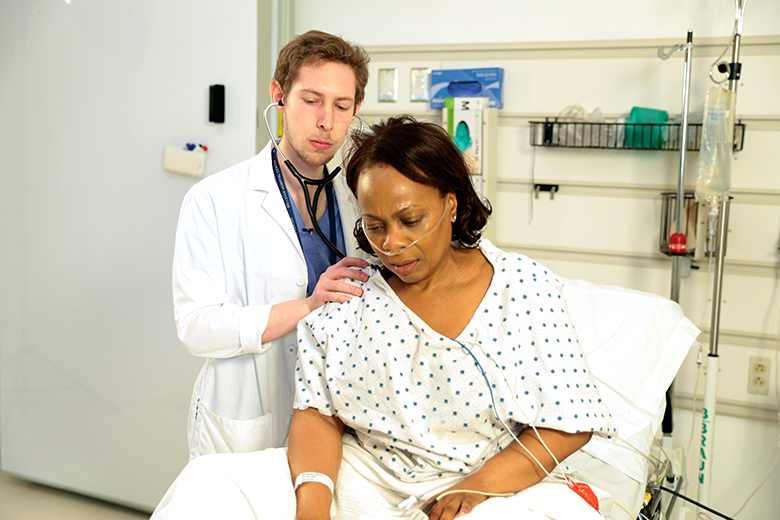 An active research program at the NYU School of medicine has been investigating the design and blending of first-person, “on-call” simulations with the self-directed WISE-OnCall activity to create a unified, pre-residency learning experience. 10 modules focus on high-risk symptoms. Common causes are reviewed and a video case dramatization follows. Other important clinical activities (Documentation and Certifying a Death) are covered in additional modules.